Does anyone know if MS Office 2011 works in High Sierra? I'd like to upgrade, but I'm on a deadline and I can't spend a lot of time upgrading right now. Plus, I really detest "subscription" software which apparently is the way Microsoft is going. I have Microsoft Office 2011 installed on 2011 and 2013 iMacs. 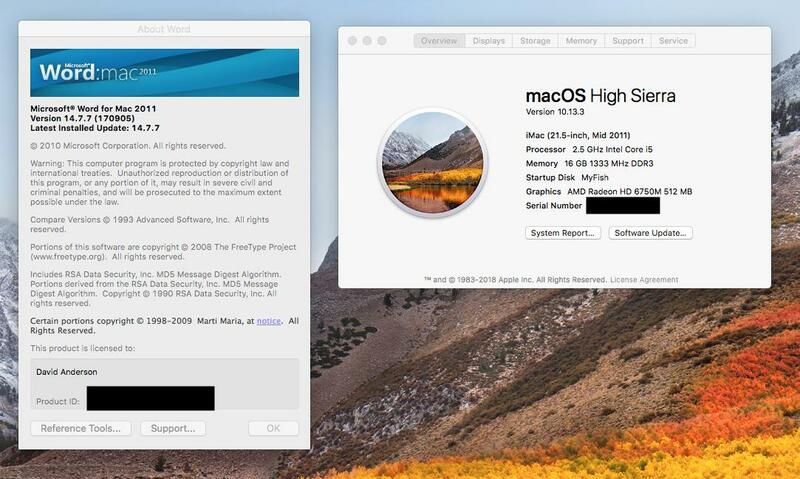 Both Macs have been upgraded to High Sierra (macOS 10.13.3). I have not noticed any problems. The update shown in the image below is available from Microsoft Office for Mac 2011 14.7.7 Update. The publish date for this update was 9/7/2017, making this is a fairly current update. "Deadline" and "upgrade" should be mutually exclusive concepts and not procrastinatory temptations. MS Office 2011 does not work on macOS 10.13 High Sierra, officially. Microsoft has already ended all support for this package and wants you to switch. and of course friendlier alternatives like LibreOffice, complicated constructions including virtual machines and with Windows or macOS etc. All fair game and nice to play with. But then there is this dreadful word again: "deadline". I discovered the following two functions in MS Word 2011 disabled after my Mac is upgraded to High Sierra: Mathtype, and Cut-and-Paste. Not the answer you're looking for? Browse other questions tagged ms-office high-sierra . Excel Data Analysis ToolPak available for download for Microsoft Office for Mac 2011?